30 x 30cm oil on linen. Hot and sour soup is all about achieving a balance of these two flavours. 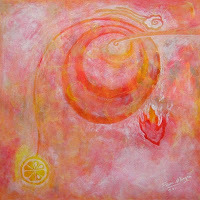 This piece is also all about the concept of balance, of getting multiple variables just right for your individual taste. 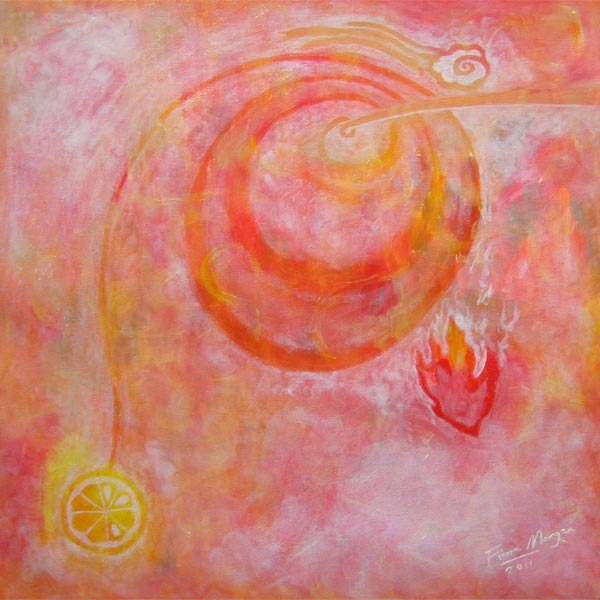 A hair or balance spring represents this idea and I'm sure that you can figure out what the lemon and fire denote. Hot and sour soup is a staple on Chinese restaurant menus around here and I love it. However, it is not very filling, being little more than a tasty broth. For a hungry person this is bad. Apparently it is often flavoured with blood. For a vegetarian or anyone squeamish this is super bad. Due to both of these issues I devised, long ago in my student days, this cheap, quick, filling and animal friendly version that I could make at home in a gigantic pot and live on for days. I hope you like it as much as I do. Put the water, coriander, salt, carrot and ginger slices in a large pot and simmer, lid on, for 20 minutes. Remove ginger and coriander roots. Add mushroom, tofu, bamboo shoots, grated ginger and simmer until mushrooms are cooked. Add your choice of noodles and keep simmering until these are cooked. In a mug or similar, mix cornflour, soy sauce and sesame oil until all the lumps are gone. Add this to the soup. Stir until it thickens. Add the pepper and vinegar a little at a time, until the dish suits your taste. I recommend adding the vinegar first until it is pleasantly sour, and then adding the pepper until the heat is right for you.